It’s said there are 10 types of people: Those who understand binary and those who’d prefer to interface with it in a more human way. Even über nerds need assembly language by which to address the machine when programming, while the rest of us fare better with graphical user interfaces. Hardware analog synths have GUIs, y’know - the knobs, sliders, buttons and switches that shield our delicate muzos’ minds from the complexity of circuitry within. As for the machine code of digital synthesis, well, that’s just mad stuff for robots. But developer iZotope has taken a chuck from the drill of graphic design to put an interesting spin on how to access the very guts of digital audio and mess it up. You can’t get much more GUI that the environment offered by photographers’ and designers’ favourite, Adobe Photoshop. So how about taking some of this pixel-crunching package’s drawing functions and applying them to a graphic of a waveform, its character to mutate? 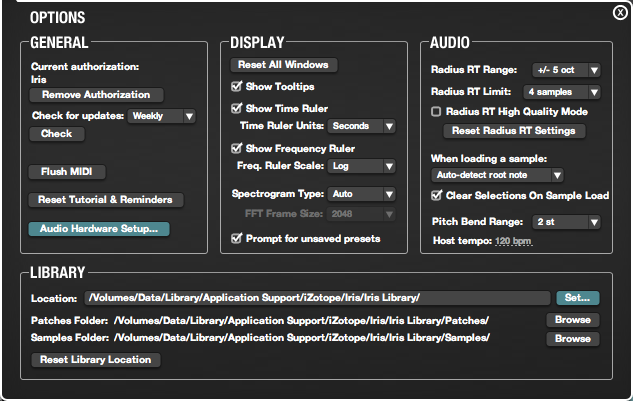 That is the essence of iZotope Iris, a novel VST/RTAS/AU or standalone resynthesis engine for Mac and PC. 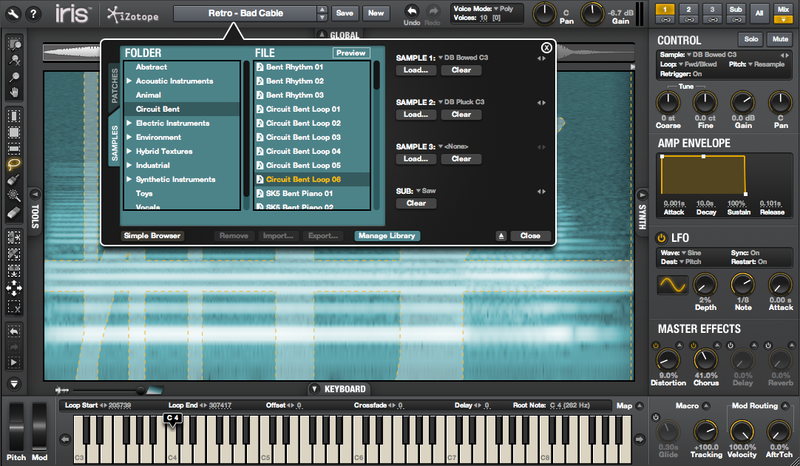 Into Iris, you load samples, render them as spectrographs and make selections based on time and frequency. If at all familiar with iZotope’s audio-repair suite RX 2, you’ll immediately recognise the visuals of this instrument’s central waveform/spectrographic view. The horizontal axis shows time; the vertical, frequency, which can be linear, logarithmic or other divisions; while shading, from black (silence) through lusciously lurid turquoise to white, shows energy, or loudness. You’ll find pertinent accounts of Iris’ feature sets on iZotope’s Iris product page and that of UK distributor Time+Space. You may also cop for the fact that an introductory offer is valid, hence the * in this post’s heading, until 4 May: $149/£99 for the synth engine including a 4GB sample library, or $199/£129 for Iris+2, which includes the Glass ($49/£34.95 separately) and Wood ($29/£19.95) sound libraries. Iris itself has more than 500 patches, while Glass and Wood add 100 patches apiece featuring encounters with said materials based on 150+ and 260+ samples respectively. Let’s head back to the performance end and ponder two significant aspects of the interface. We’ve a Browser by which the sample and patch libraries are accessed and, usefully, it’s divvied up into categories, from Ambient to Vocal to User. You can, of course, ignore the bundled sample library and go wandering off into your own collection, loading whatever WAVs or AIFFs are in your archive (sorry, no MP3s allowed). Acidized WAVs and Apple Loops also load, although the latter appear to have deranged attributes that’ll need removing. RX2 files, meanwhile, just sit there, stubbornly awaiting the attentions of iZotope’s sadly discontinued pHATmatik Pro REX mangler or Propellerhead Software Dr:REX in the Reason rack (ie, REX is not a file format that Iris recognises). Archive management is via our second aspect of significance, Options. It’s not under Preferences, where you’ll find general audio settings and a test tone facility, but accessible via a spanner icon in the main interface. This is where you locate the Samples and Patches folders once they’ve been hived off the System drive, although there’s the means to install the library to an external drive during installation. Options is also home to a second set of Audio gadgets, including the means to set tempo in standalone mode (as a plugin, Iris will lock to the tempo of the host DAW); pitch-bend range up and down by up to two octaves; and an Auto-Detect facility. Handy, in that you can have Iris attempt to map the imported audio to the correct key, set it so that C4 is always the root note, or do nothing. A bit of a time saver. The developer is quick to point out the ease with which one can explore a sample and has bundled masses of animal, machine, instrument and synthetic examples, including takes from the ARP 2500, EMS VCS3, Yamaha CS-80 and more. 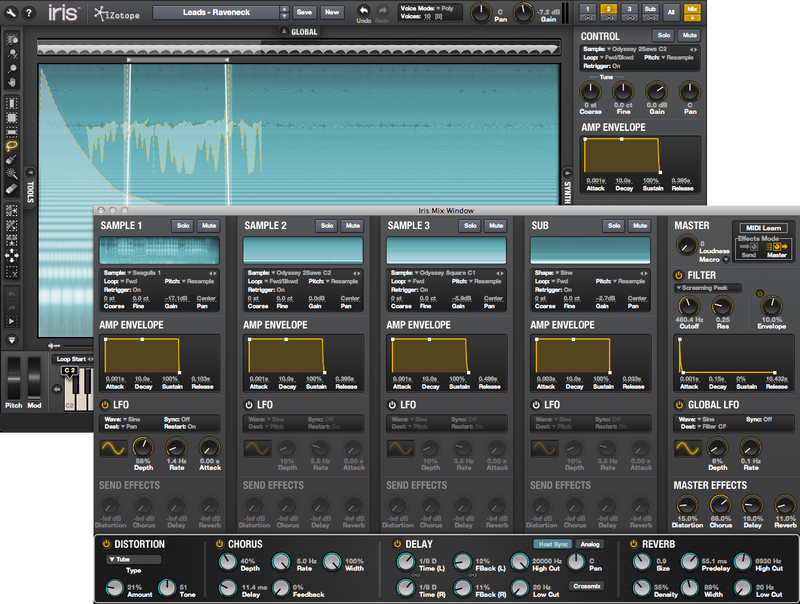 Iris’ facilities to hone in on samples’ specific harmonics and temporal elements, edit those selections visually and mutate them further with traditional synthesizer controls make it a wonderfully powerful audio-sculpting tool. You can readily see how more adventurous muzos and deranged sound designers may fall into its limpid pools. Provided, that is, they lay off Distortion. Where Chorus, Delay, Reverb and the flexible Filter array do their jobs well, the Distortion settings are harsh and unmusical, although thine and mine own definitions of musical may differ. A fletcher appears to have been busy in Boston, for yet another feather in Iris’ quiver is Macro Styles. 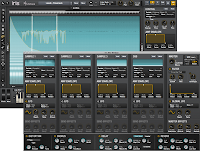 Once you’ve got synth and effects settings as you’d like them, they can be assigned to an eight-knob Macro which, with MIDI Learn engaged (highlighting every automatable parameter in eye-searing Cyan), offers huge potential for sound-warped sequences and huge jollies on stage. There are preset macros available, but creating your own is relatively painless - check out the Groove 3 video tutorial Iris Explained by Russ Hughes for lucid detail on the creation of Macro Styles. 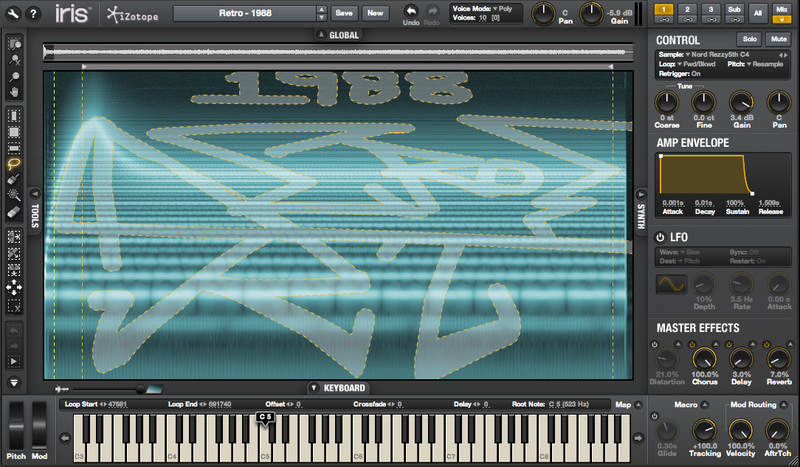 There’s a few features that, once you get an eyeful of Iris, you’d like enhancing, such as feathered selections, graduated selections and the ready means to copy selections from one sample or patch to another. This can be sort of managed by un-checking Clear Selection on Sample Load in Options, then dropping a new sample over an existing one. The selections made will be scaled to approximately the length of the new sample, which is not how it’s done in Photoshop. Then again, this is not Photoshop. Iris 1.00.748, to give the software its proper name, is a first shot at something very ambitious. While we’re used to stacking sounds, carving them up and mutating sampled waveforms in other synths, Iris offers a fresh take on extracting and manipulating audio in the spectral domain. 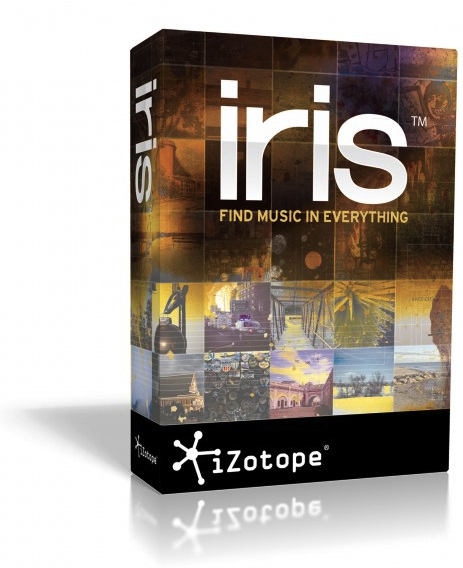 Says iZotope: “The response to Iris has been incredible and we are learning about what features our customers would like to see in the future. Stay tuned!” So, further development is hinted at. If you plan to buy in now, make sure to do so prior to May 4 - the introductory offer is a steal considering the wealth of audio content and sheer facility of sound sculpting available. Just make sure to download the demo first and assess whether Iris' radical synthesis tools are enough to keep your eyes on stalks.